This chapter provides an overview of quantitative assessment of the left ventricle's size and both systolic and diastolic function. Detecting and quantifying LV hypertrophy with ultrasound is complex. There are different forms of hypertrophy, which can be diffuse or localized. Diseases like amyloid, sarcoid, and Fabry cause hypertrophy of various types. Only measurement of the interventricular septum (IVS) at end diastole is needed for most patients. End diastole is the image with maximum LV chamber size and the mitral valve just floating shut. The PLAX is a standard view to measure the IVS, but there are several ways to get false measurements: not being at end-diastole, falsely including RV structures (e.g. moderator band) in the measurement, and being oblique rather than perpendicular to the septum. Nevertheless, with a good PLAX view the basal IVS (anteroseptum between mitral valve and papillary muscles) should be measured, as in the following image. Here are the reference standards for the IVS. In the patient above, the IVS was mildly increased in the PLAX, so confirmation was needed. The PSAX may sometimes be good for IVS measurement if the view is clear. This measurement should also be taken in between the mitral valve and papillary muscles. Here is the PSAX measurement on the same patient, which seems to agree with the PLAX measurement. Discrete upper septal thickening (DUST)/sigmoid septum/septal bulge/septal knuckle is relatively common, especially in older patients. It is associated with hypertension, but not hypertrophic cardiomyopathy, and should be less than 3 cm in length. Here is a diagram demonstrating the abnormality. The IVS measurement should be taken distal to this bulge but before the papillary muscles. DUST is not completely cosmetic. It can cause turbulence in the outflow tract (resulting in a murmur) and hypovolemia or hyper-catecholamine states may cause temporary obstruction of the outflow tract with systolic anterior motion (SAM) of the anterior leaflet of the mitral valve. Thus, SAM is not specific to HCM. Here is a clip from a patient with a modest septal bulge. The apical4 view may show the IVS clearly, particularly when RV enhancement is used so the beam is more perpendicular to the IVS. However, lack of good endocardial resolution in this window, due to the ultrasound beam being parallel to the endocardium of the IVS, may result in under measurement of the IVS. Magnification is often helpful to accurately place the calipers. The measurement is taken in the basal inferoseptum. Here is an IVS measurement in the apical4 that was clear even without an RV enhanced view. Don’t forget that the subcostal view may be very good for the IVS because it may be nicely perpendicular to the ultrasound beam. The IVS is not measured in every view when it is clearly normal. But, an abnormal width in any view should be validated in other views to avoid overcalling septal hypertrophy. LVEDD varies with patient height and is measured at the same location and time as the IVS, measuring from endocardium to endocardium. Ideally, the IVS and LVEDD measurements are taken toward the end of expiration when the LV is most full. If LVEDD measurements in different views don’t agree, report the largest measurement. 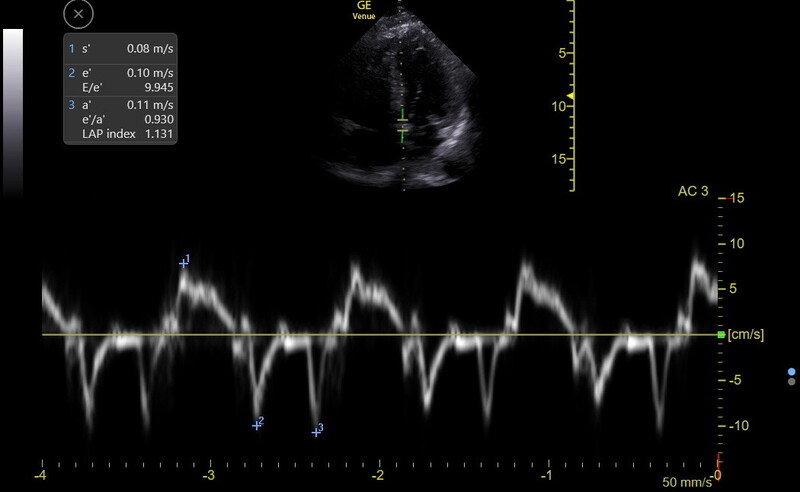 Again, note the typical decrease in basal endocardial resolution when viewed from the apical window, and thus the potential to over measure the LVEDD in that window. The PSAX and subcostal views may be better for confirming LVEDD. When measuring in the PLAX view it is important to carefully observe the live 2D images to be clear where the chordal structures of the posterior-lateral papillary muscle abut the inferolateral LV wall because the junction may be difficult to see in the end-diastolic frozen image. Here is a PLAX LVEDD measurement. Here is an apical4 LVEDD measurement using a slightly LV enhanced view to be sure that the anterolateral LV wall was clearly seen. The normal range for the LVEDD must consider the patient’s height to avoid misclassifying shorter and taller adults. LV function is a complex mix of wall thickening, inward (radial) motion, longitudinal motion, rotatory motion, and active relaxation and an IMBUS exam can’t measure all of these. The rest of this chapter is complicated for an early learner. Yet, these analyses must be performed accurately or incorrect conclusions about a patient can be reached. A novice needs careful repetitions with a mentor to be proficient and to recognize the limitations of the methods. Eyeballing of LV radial function works (categorizing as normal, mild/moderately, or severely reduced), but requires experience and an ability to integrate multiple views of the LV. Eyeballing should be supplemented with a few measurements most of the time. Ejection fraction by Simpson biplane method is not practical for IMBUS and has limitations. Standard fractional shortening is an estimate of radial systolic function at only one particular LV site so shouldn’t be an IMBUS standard. E-point septal separation (EPSS) in the PLAX view is a screening measurement that assesses a combination of LV size, function, and anterior mitral valve (MV) leaflet movement. It measures the gap between the closest approach of the anterior mitral leaflet tip to the basal anteroseptum. M-mode through the end of the leaflet best visualizes this gap because of the higher frame rate. This technique can also detect systolic anterior motion of the MV (SAM) and confirm atrial contraction. When it is difficult to get M-mode perpendicular to the septum and motion of the valve leaflet, some machines have Anatomic M-mode that may get a more accurate measurement of EPSS. On all machines, optimizing the IVS image with depth, width, and focus position may be important. in late expiration. This requires the examiner to time the respiratory cycle with the hand/forearm on the patient’s chest. The tracing is started at the onset of an expiration and then frozen at the end of expiration. The best complex for measurement is found near the end of the tracing. Here is a normal EPSS with a small gap between the leaflet and the IVS. Calipers were then used to measure the width of the gap. If the anterior MV leaflet visually slaps the septum EPSS can be recorded as zero without M-mode measurement. However, M-mode EPSS has the additional benefits of identifying SAM and the presence of left atrial activity (the presence of the A motion) so is often still worth doing. An EPSS progressively greater than 0.7 cm is increasing evidence that something is abnormal with LV size/function or with the leaflet (e.g. mitral stenosis or eccentric aortic regurgitation). However, on some machines without anatomic M-mode, an abnormal EPSS may result from an oblique, rather than perpendicular, cut through the septum. Longitudinal LV Function: Although longitudinal function comprises only about 10% of overall LV systolic function, it varies depending on the region of the LV and reduction in longitudinal LV function can be an early marker of various types of LV dysfunction. 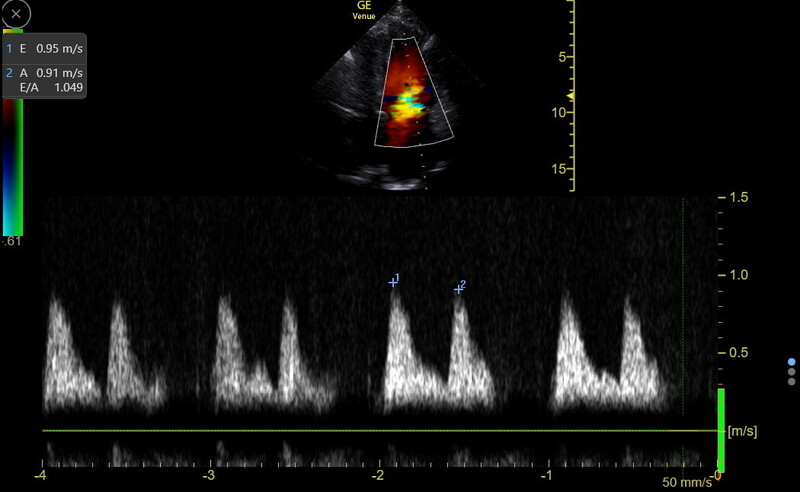 Mitral annular plane systolic excursion (MAPSE) with M-mode in the apical4 view is the easiest way to assess longitudinal function. It measures the amplitude of the MV annular movement. Understanding the location of the MV annulus is important for MAPSE and also for tissue Doppler imaging that is covered in the next section of this chapter. The annulus is a ring of fibrous tissue (a little more hyperechoic than myocardium) that supports the MV apparatus. On the screen, the septal part of the annulus in the apical4 view lies medial and a little apical to the base of the septal leaflet. It is not a particularly thick ring and is in continuity with the annulus of the aortic valve. The annulus lies vertically between the IVS and the interatrial septum and is passively moved by the myocardium in both chambers. The following drawing shows the location of the septal and lateral mitral annuli, but only the septal annulus is used with IMBUS. For MAPSE, the M-mode line needs to go through the annulus and be as parallel as possible to the vertical motion of the annulus. An optimized image of the annulus can be very important for a good tracing. Anatomic M-mode may occasionally be useful to be perfectly parallel to the annular motion. Position the cursor so it is best for end expiration, as in the following clip. The side to side movement of the annulus is due to respiratory movement. Activate M-mode at the start of expiration and if complexes look good, freeze at end expiration and find the best complex towards the end of expiration. Measure the difference between the peak and the valley of the annulus excursion. Doppler analysis of LV function can be difficult to do, and inaccurate measurements may do more harm than good. The IMBUS technique measures the velocity of blood flow into the LV through the mitral valve and the velocity of septal mitral annulus tissue movement. Together, these values give information about longitudinal LV function, the stiffness of the LV, peak left atrial pressure (LAP), and left atrial function. Additional interpretation of these measurements will be discussed in several future chapters. The IMBUS exam will not measure all the parameters determined by a high level echocardiography lab but should result in overall conclusions that are consistent with such a lab. LV Inflow Analysis through the mitral valve measures the maximum velocity of the E-wave (early diastolic inflow caused by the pull of LV suction and the push of LA pressure) and the A-wave (late diastolic inflow from atrial contraction). These velocities are usually maximum near the tips of the open mitral valve leaflets at end expiration. The exam starts with a good apical view of the LV and LA with both mitral leaflets visible. Step 1: The left heart must be adjusted so the angle of flow through the mitral valve into the LV is as parallel as possible to the Doppler cursor coming from the upper center of the screen. If the machine does not have angle correction for continuous wave Doppler, this may require moving the LV toward the middle of the screen along with a bit of RV enhancement of the septum. Step 2: Color Flow Doppler (CF) is activated, the sector box size is optimized for the LV inflow area, and the probe is then fanned “front to back” to find the plane with maximum intensity of the inflow signal (red flush) during expiration. Step 3: Continuous wave Doppler (CW) is activated. CW measures velocity all along the line. The center of the line contains a “focal point” which should be placed near the tips of the open mitral valve. Next is a clip showing correctly positioned CW during expiration. On some machines the CW angle can be corrected so that it is more precisely parallel to flow and this improves accuracy. When the CW tracing is first activated, the machine settings may need adjustment before measurements are obtained. The baseline may need to be moved down the screen because positive waves will be measured but negative waves still need to be seen. The Scale may need to be moved to a lower setting to measure velocities < 150 cm/sec. Finally, the Sweep speed may need adjustment so enough complexes are seen. The tracing is frozen at the end of expiration and the complex with the maximum and clearest E wave is selected. The following patient did not have a negative systolic wave, so it was acceptable to lower the baseline to the bottom for measurement of E and A. The closing of the mitral valve leaflets may be seen in the tracing as a vertical line right after the A-wave, but multiple vertical lines through the tracing usually means that chordal elements have entered the tracing and the gate line may not be parallel to inflow. If mitral regurgitation is present, a negative wave may be seen during LV systole. A negative systolic wave may also be seen if the gate passes through part of the LV outflow tract, usually indicating that the gate is not optimally parallel to LV inflow. We have also seen an eccentric aortic regurgitation jet right in between the E and A waves. E-wave velocities are usually ≤ 125 cm/sec (1.25 m/sec), but there are conditions with higher velocities (well hydrated athletic heart, mitral stenosis, mitral regurgitation, decompensated heart failure). In these situations, the Scale is changed to see the higher peak of the E-wave. Measure the velocity of both E and A waves. In IMBUS patients, a key calculation is the E/A ratio, which the examiner does with a calculator or the machine does automatically. E-waves vary more than A-waves with LA filling and LV function, so the E/A ratio is dynamic. E, A, and E/A vary substantially with age. The following table shows the weighted mean values (by decades) from a metanalysis of published studies of these values. The E velocity falls as the LV suction decreases with age and the A velocity increases as there is more dependence on the atrial contraction to empty the left atrium. Left atrial dysfunction: dysfunction of the left atrium with preserved sinus rhythm does occur. Both HFPEF and amyloidosis are known to reduce atrial function without causing atrial fibrillation. This can decrease the A-wave velocity below what is expected for age. This becomes important in analyzing an elevated E/A ratio as discussed in the Diastology chapter. Atrial fibrillation patients lack an A-wave, so all that can be measured is E. This measurement may have utility, but the difficulty is the beat to beat variation in the E-wave. Multiple E-waves must be measured to derive an average E-wave velocity. This is tedious, so the utility of IMBUS LV inflow analysis in an atrial fibrillation patient is only to quickly identify patients with very high E-wave velocities indicating one of the several conditions noted above. PW LV Inflow analysis: The CW tracing may be suboptimal because the gate line cannot be aligned parallel to the LV inflow. The analysis is then performed with PW, which measures just at the small gate, rather than along the whole line. Careful placement of the PW gate is essential. The gate line positioning steps described above for CW are still needed and the PW gate is carefully placed just past the tips of the open mitral valve. If the gate is too distal or proximal in the LV, lower velocities may be recorded. Here is a correctly positioned PW gate that was parallel to LV inflow. The PWD tracing should also be optimized with Line, Scale, and Sweep speed adjustments. The tracing is begun at the start of expiration and frozen at the end of expiration. The complex with the highest E-wave toward the end of expiration is selected for measurement of E and A as in the following tracing. In several published reports, CW measurements of E and A waves were about 10% higher than PW measurements and the IMBUS experience supports this. 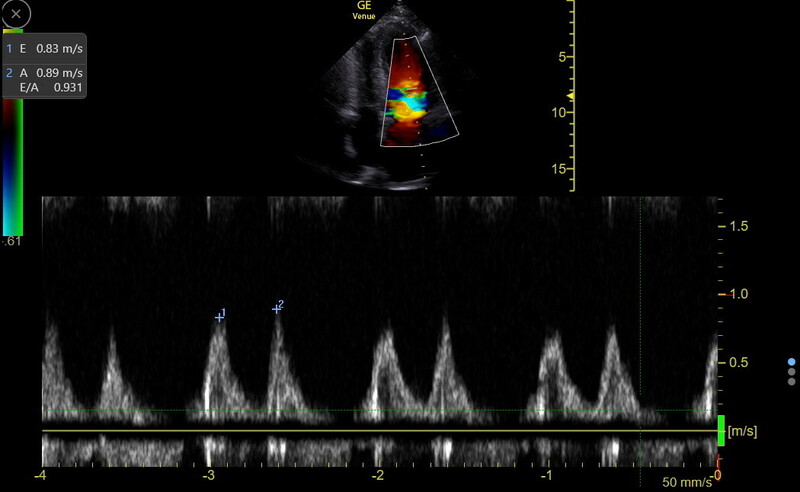 A 2009 joint statement by the European and American echocardiographic societies noted, “CW to assess peak E and A velocities should be performed before applying the PW technique to ensure that maximal velocities are obtained.” Thus, the IMBUS routine for LV inflow analysis is to first try CW and then move to PW if the CW tracing is suboptimal. Tissue Doppler (TDI) analysis of the septal mitral annulus can be difficult and the subtleties need to be known to avoid misclassification of patients. It measures the velocity of movement of the mitral annular tissue, including the positive s’ (systolic), negative e’ (early diastolic), and negative a’ (late diastolic) waves. For PW TDI, the gate must be carefully placed to encompass the annulus and be parallel to its movement. The gate target is the same that was used above for MAPSE, which on the screen means medial and a little apical to the base of the septal leaflet. However, the vertical gate position is also critical. If the gate is a little above or below the annulus, the waves change, almost always with a disproportionate reduction in the e’. This means that equivocal or low e’ values always need careful confirmation of correct gate placement. TDI analysis should probably not be performed on an atrial fibrillation patient. TDI should also not be done when there is significant mitral annular calcification, previous mitral valve repair or replacement, abnormal basal septal wall motion, significantly impaired right ventricular function, or ≥ moderate mitral or aortic regurgitation. Finally, left atrial dysfunction can lower the a’ velocity and confuse interpretation as discussed further in the Diastology chapter. Step 1: PW and TDI are activated for a machine. The default settings should usually be used. As with MAPSE and LV inflow analysis, TDI measurements should be performed in later expiration to be optimal. Fortunately, this is usually when the best views of the annulus are obtained. Find the apical window that is best for expiration and position the gate so it is optimal toward the end of expiration. Optimizing the image of the annulus can substantially improve the tracing. Step 2: A vertical or slightly RV enhanced septum is needed to get the TDI gate line as parallel as possible to the direction of annular movement. Some machines allow angle correction of the TDI gate. Magnification on the annulus may be needed to position the gate optimally. Make sure the Scale and Sweep speed are correct. Here is a TDI gate that was correctly positioned for at least some of the cycles. Step 3: After the settings are correct, activate the tracing at the start of expiration. Freeze at the end of expiration and pick the complex with the largest, clearest e’ wave. A falsely high e’ is rare (unless the scale is too low creating large waves), but it is easy to get a falsely low e’ with suboptimal gate placement. Most suboptimal tracings are caused by suboptimal gate placement. The s’, e’, and a’ peak velocities are measured with calipers and the e’/a’ ratio is calculated. The following is a good TDI tracing. The s’ from a good tracing is a modestly better measure of longitudinal LV function than MAPSE, but having both is good when LV function is particularly in question for a patient. A low s’ certainly needs a confirmatory MAPSE and a low s’ with a normal MAPSE requires confirmation of correct TDI gate placement. The s’ (like MAPSE) doesn’t vary with age (8-13 for all ages). The LV inflow section above noted that reduced LA filling reduces E more than A resulting in a fall in the LV inflow E/A ratio. While reduction in LAP can also modestly reduce e’ and a’, the fall is proportional in most patients so the e’/a’ ratio may be a more consistent measure of LV stiffness than is the e’ across varying LAP. Both e’ and the e’/a’ ratio fall as patients age. As was noted above, a’ can also decrease when left atrial function deteriorates and this causes an increase in the e’/a’ ratio. All of this will be pulled together in the Diastology chapter. Here are the normal ranges for s’, e’, and e’/a’. This means that about half of patients in their 60s and 70s meet the standard definition for diastolic dysfunction and a strong majority of patients in their 80s have stiff hearts! This condition results from prolonged, intensive endurance training. The septum is rarely over 1.3 cm and both the right and left ventricles may be slightly above normal diameter. Radial LV function can appear low normal by eyeball and even by EF, but just having a patient squeeze a ball hard can improve the radial function. Specific LV longitudinal and diastolic function is normal to supra-normal in these athletes, eliminating the eyeball concern about reduced LV function.